I finally watched the “new” Tintin movie. 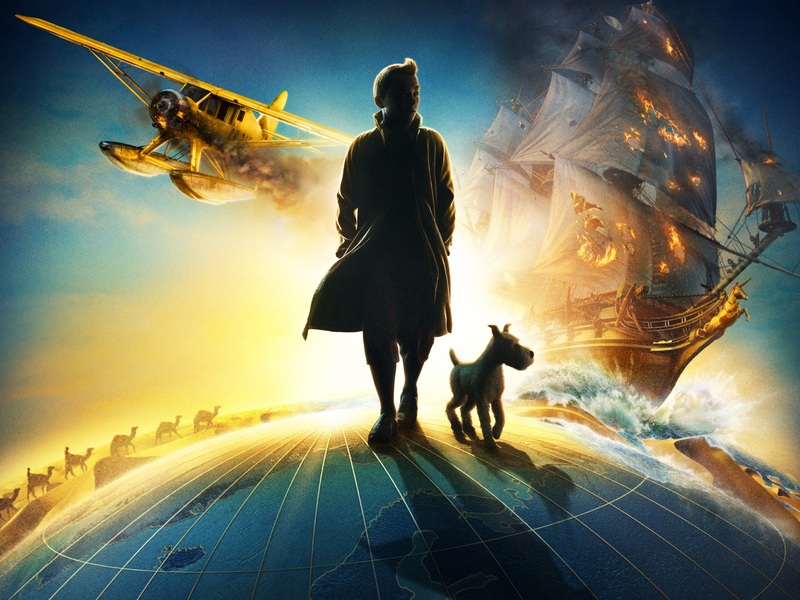 I’m obviously biased, given that I grew up reading the Tintin books and loved them uncritically for many years, but… I thought the movie was magnificent. There’s something spectacularly fun about the pulp adventures of Tintin, and the movie delivers the essence of that in spades. The story is still problematic when it comes to representation, as there’re no main characters who aren’t white males, but the movie also manages to remain faithful to its source material without engaging the more racist undertones which can be found in some of the original works. And when I say faithful to the source material, I really do mean that it’s basically all there. The movie is a composite (plus a little something new to serve as glue) of several Tintin stories, and there are scenes which have been pulled frame for frame from the originals. There are even references to prominent features of unused story lines, often featured as props (like the red jeep from Land of Black Gold). The only thing that I really missed was Snowy’s constant private cynical narration, though his stunning and dogged competence was in fine form. As I’d expected it to be, the movie was action-packed and full of nonstop excitement, accurately recreating my memories of the stories that I’d so loved as a child. But it was able to do things which had been impossible for the original comics, with gorgeous transitions that reinforced the hallucinatory exposition of my favorite drunk, Captain Haddock. I’m not sure that I’ve ever seen a better realized set of scene shifts, and they were made all the more possible through the excellent CGI used for the film. There’s just something about watching the world ripple and change, transforming a landscape of sand dunes into monstrously high seas; Haddock’s impossible descriptions of his ancestor’s exploits become all the more wonderful as they are shown through his imaginatively drunken state. Speaking of the CGI, I have to say that they really hit the nail on the head. They managed to keep things cartoonish enough that they felt palpably unreal, while still being realistic enough to feel believable, relatable in much the same way that the comics themselves felt when I was young. I’m really happy with how the movie felt, and I’m glad that there’s talk of making another. So, I liked this movie a great deal and I would happily watch it again. It doesn’t solve all the problems of the source material, but it does a good job of avoiding the source material’s larger blunders while capitalizing on its strengths. The characterizations felt true to form, and the alterations made to the original material never felt like they were unfaithful or detracted in any way from the originals. If you ever liked reading Tintin, my guess is that you’d like watching this movie. If you didn’t like reading Tintin, I really can’t help you with that (and you may or may not like this movie, who knows). p.s. Sorry to cut this one short, I have to go facilitate a hero’s journey by pretending to be an evil dean intent on shutting down Simmons’ MA in Children’s Lit and MFA in Writing for Children. This entry was posted in Books, Movies and tagged Adventure, Hergé, pulp, The Adventures of Tintin, The Secret of the Unicorn, Tintin. Bookmark the permalink.